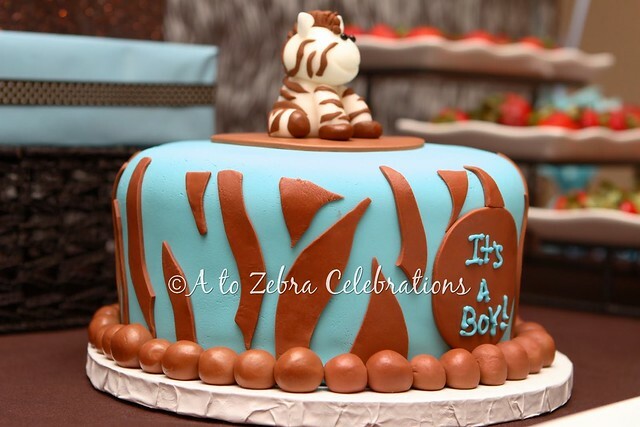 I had the honor to host my very first baby shower for one of my good friends, Julie. She is pregnant with her second little boy. His name is Luke. 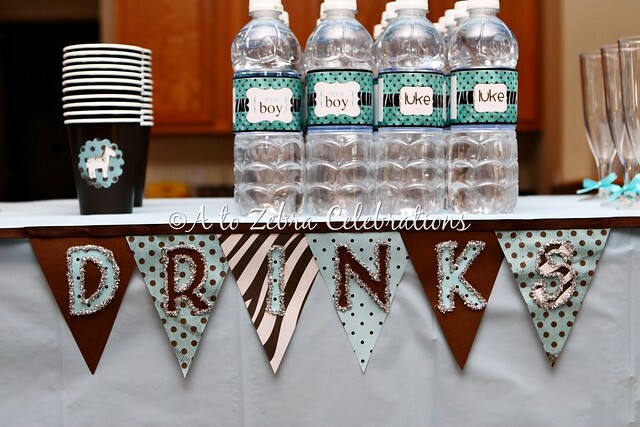 This is also my very first “BOY” party! 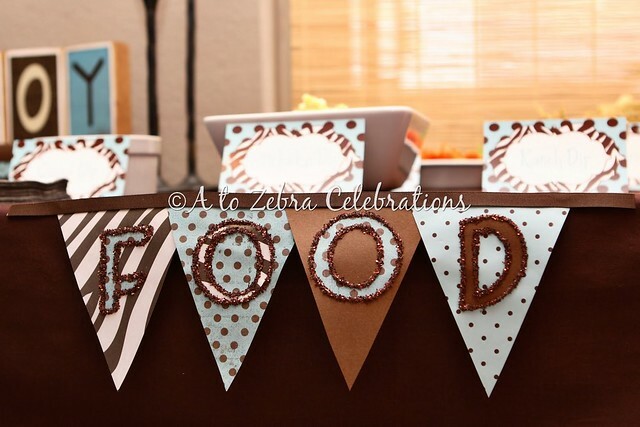 It was fun searching for ideas and seeing them come to life! 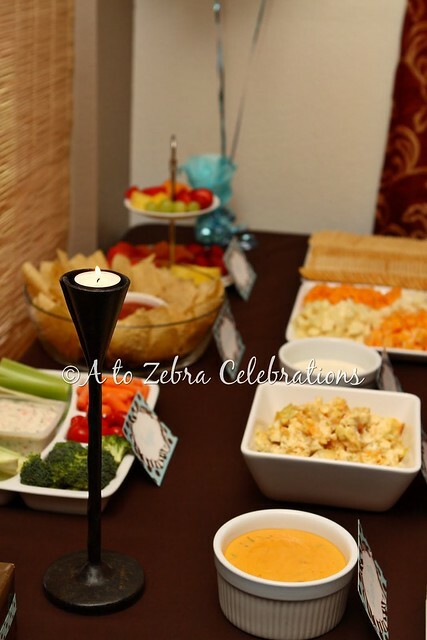 Thank you to my friend, Liz for capturing these beautiful pics! 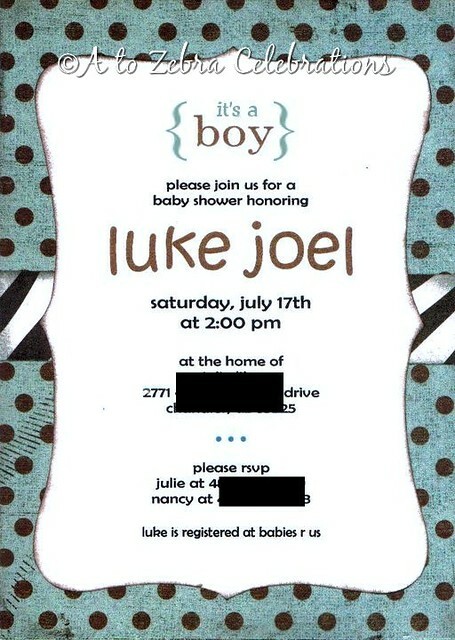 The invite was made by my friend, Tricia. 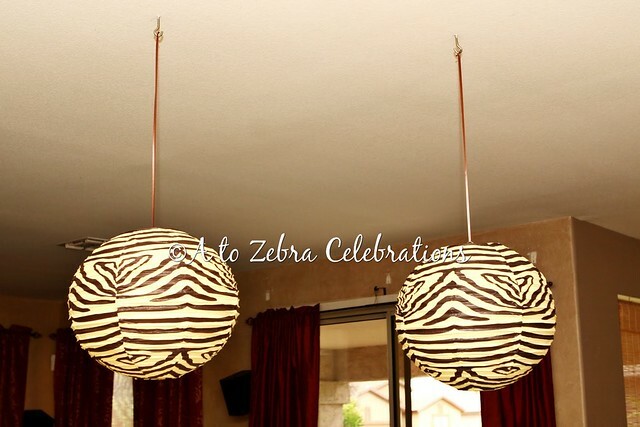 Julie really wanted to have a zebra theme. 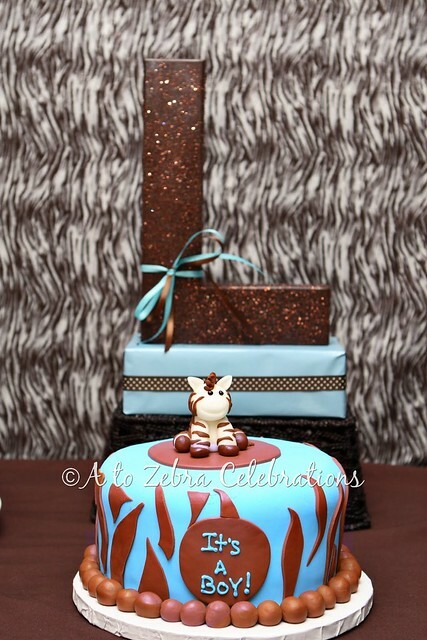 We decided to add this type of blue insted of the traditional baby blue. 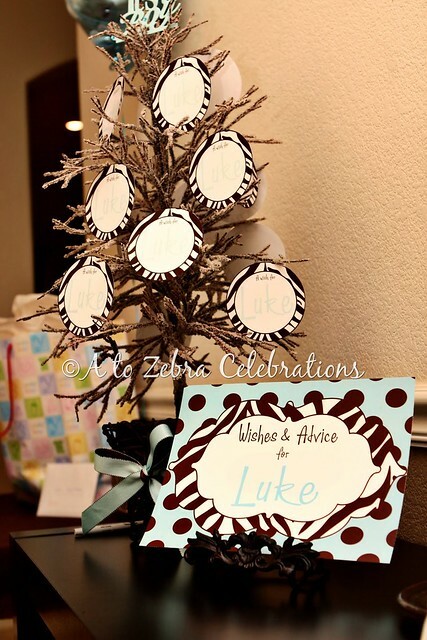 As guests arrived, they wrote a “wish” for baby Luke or “advice” for the mom-to-be on these zebra circles hanging on the tree. 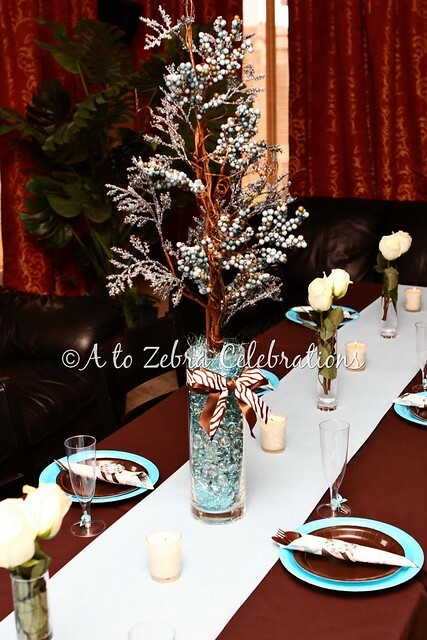 Next to this tree I set up a table for the gifts. I made the mini-banner taped on the wall. 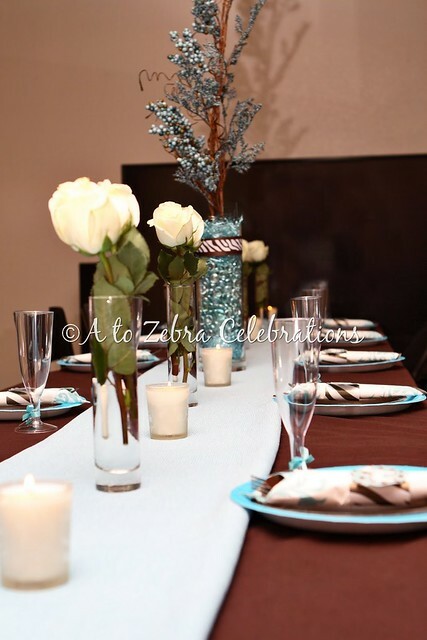 The table was so much fun to put together. 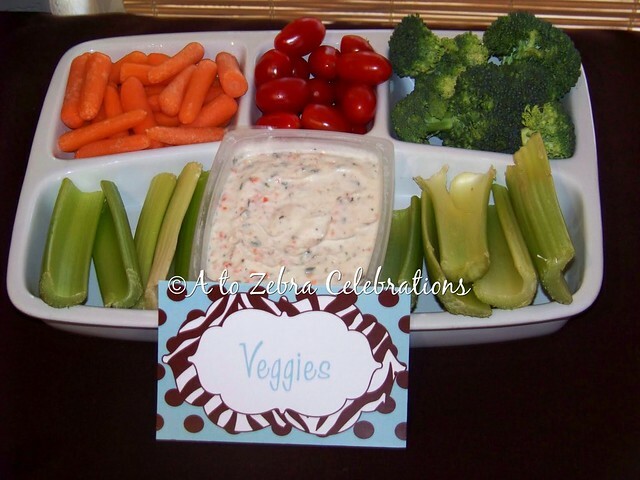 I made the centerpiece for it. 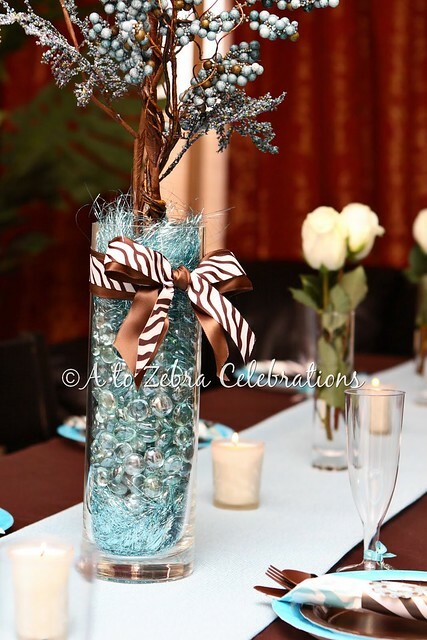 I added some votives and glass jars with fresh white roses. 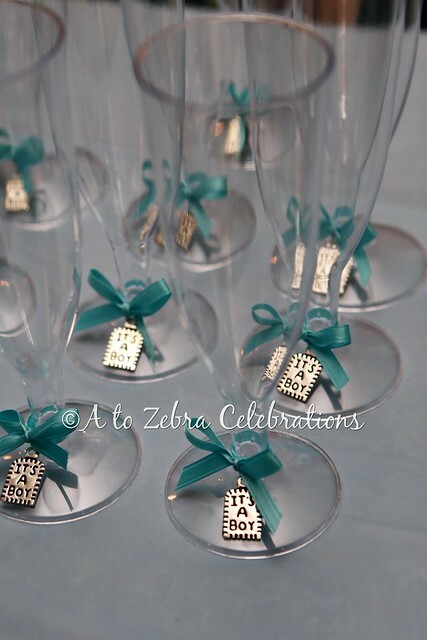 I bought plastic flutes and added a “It’s a boy” charm with a blue bow…they looked adorable! 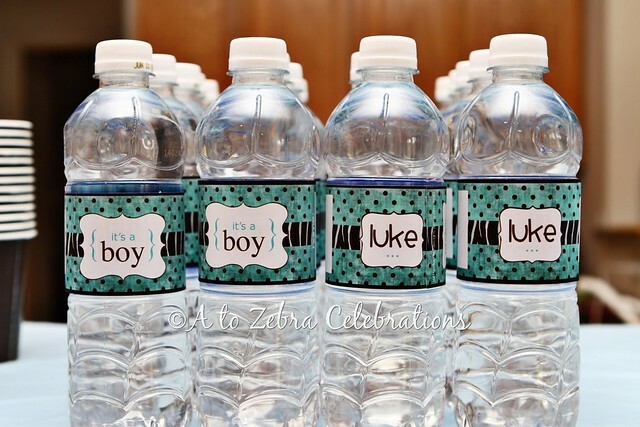 I ordered labels with baby’s name and “It’s a boy” for the bottled water. 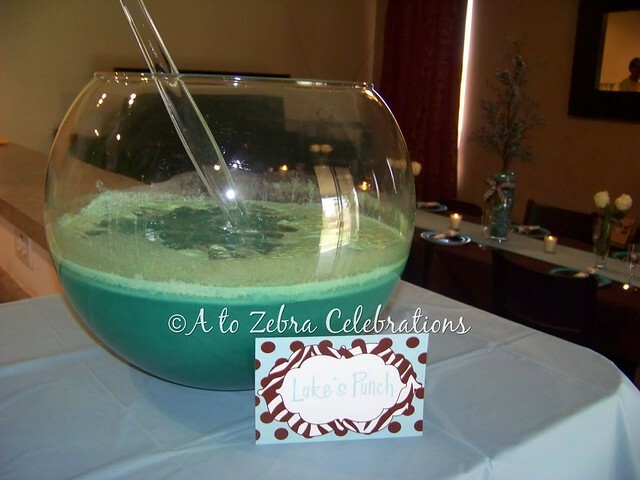 Blue punch to match the party. 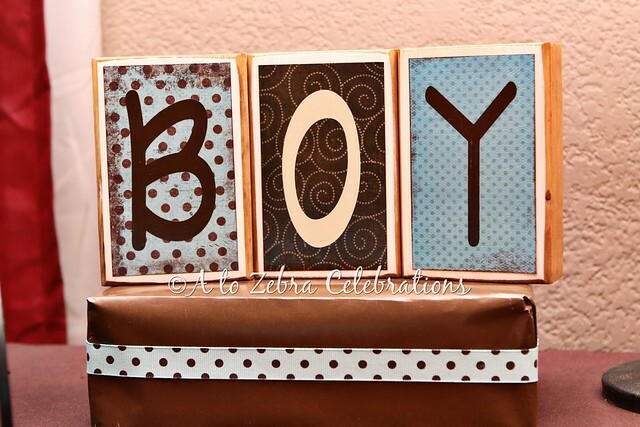 “BOY” blocks purchased from HERE. 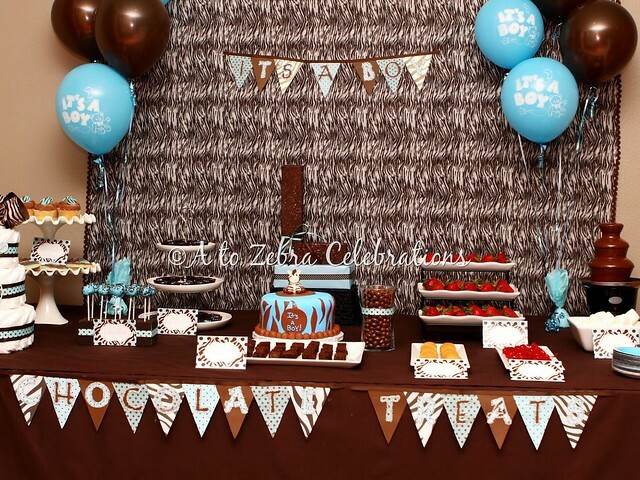 “CHOCOLATE TREATS” table. 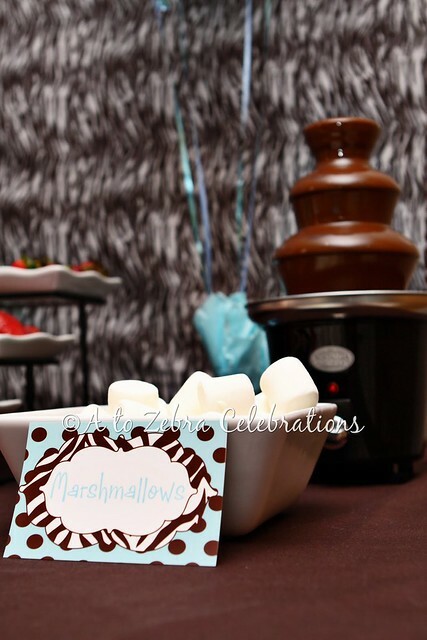 Julie and I decided to have all chocolate desserts including a chocolate fountain….yummy!!! 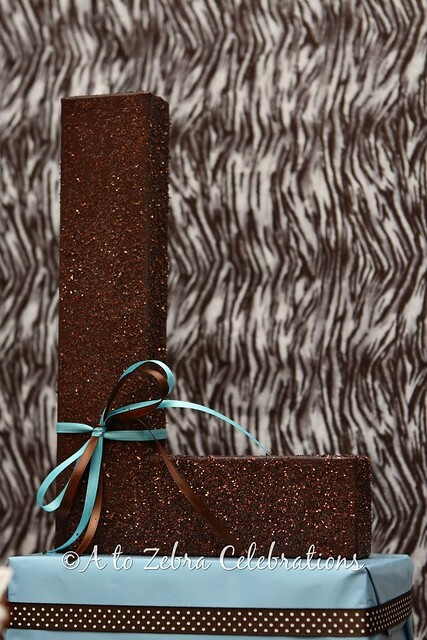 I bought brown zebra fabric at JoAnne’s for the backdrop. 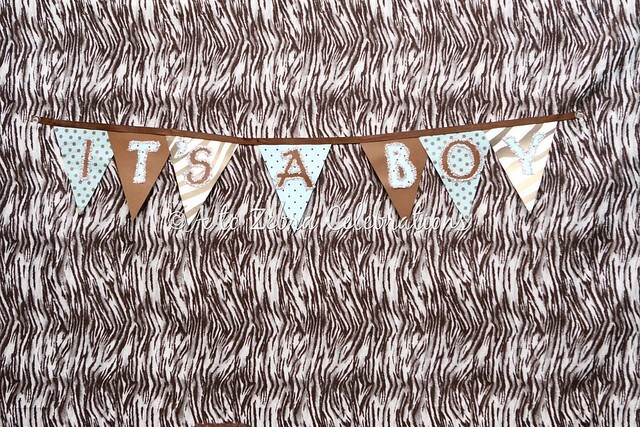 I made this mini-banner “It’s A Boy”. 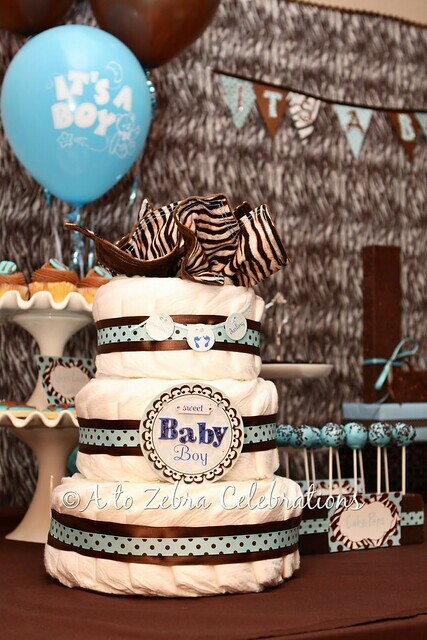 I’ve never made a diaper cake before. My friend, Lisa, came over and pretty much made it for me 🙂 I just watched and helped rolling some diapers! 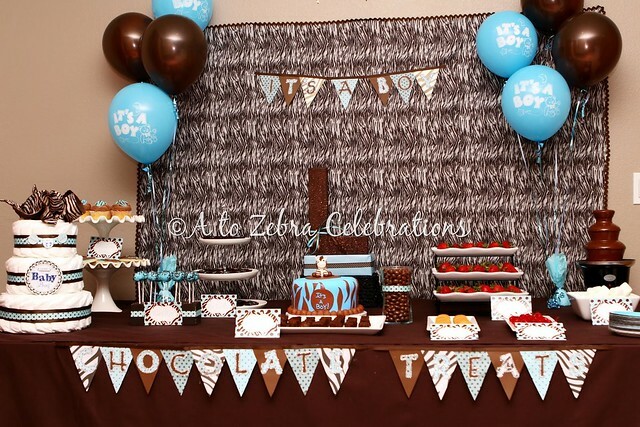 There are 3 custom-made brown zebra burp cloths at the top made by my friend, Valarie at Everything Girly. 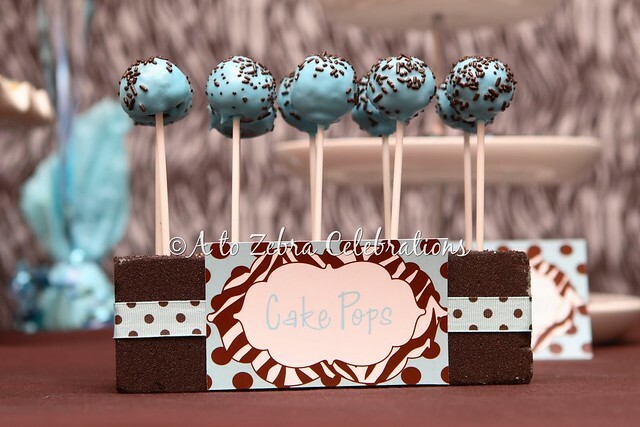 I made cake pops for the very first time….NOT fun for me. 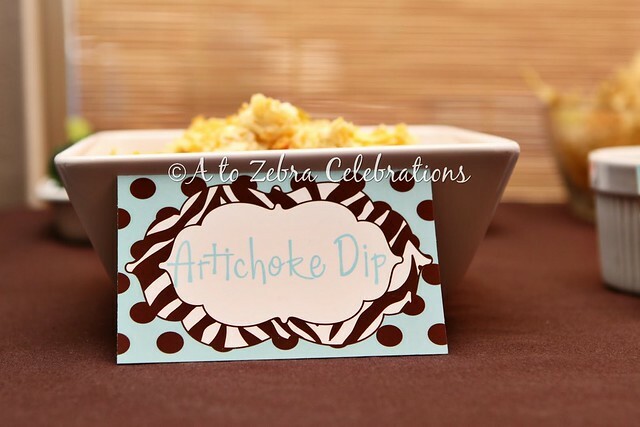 I am not a betty crocker….it was harder than I thought! Bakerella is one of my idols..ha! I made these yummy oreo truffles. 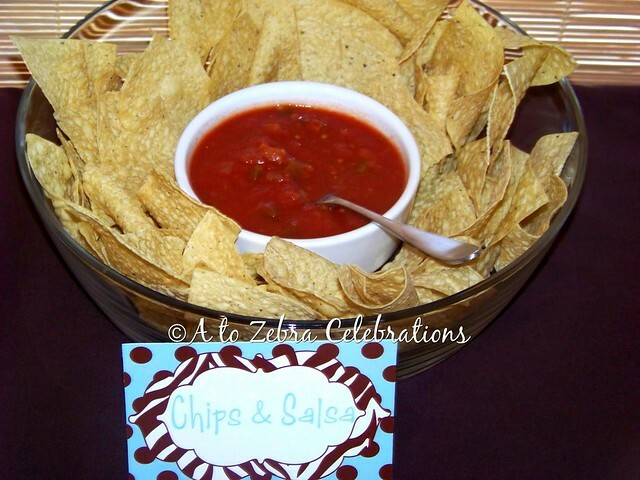 My friend, April told me about them and they were a hit!…..delish! 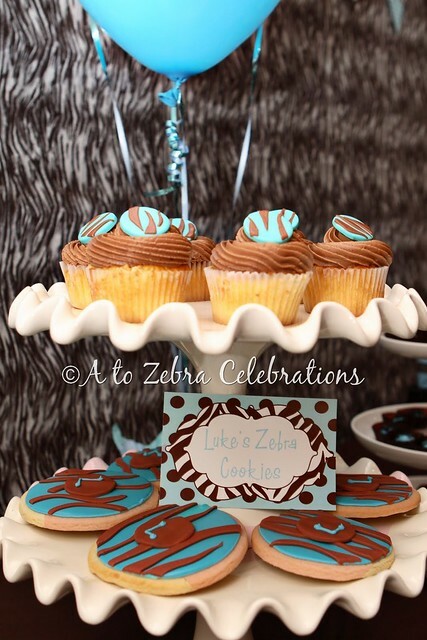 Zebra cake, cookies, and cupcakes made by Decadent Delights. They were to die for…delicious! 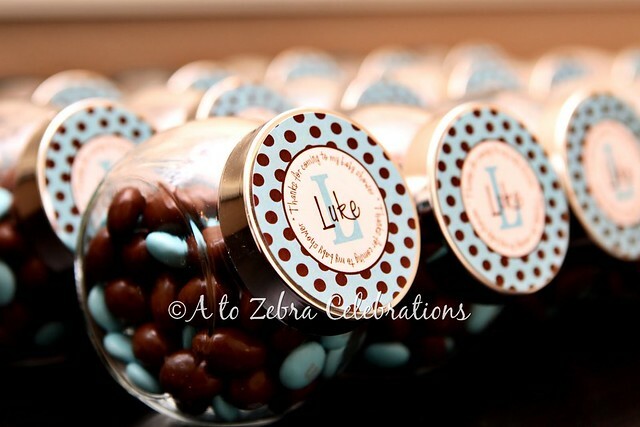 Chocolate raisins because they match…ha! 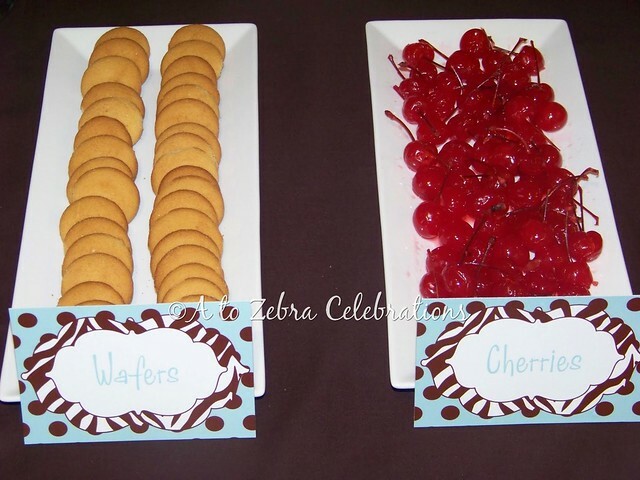 Baby shower thank you favors. 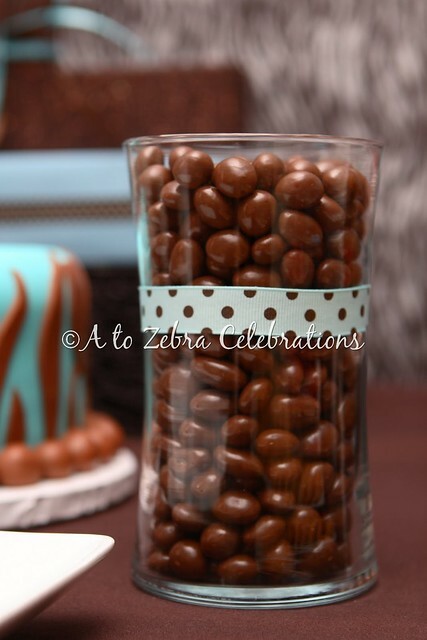 A small jar with chocolate raisins and blue m&m’s. 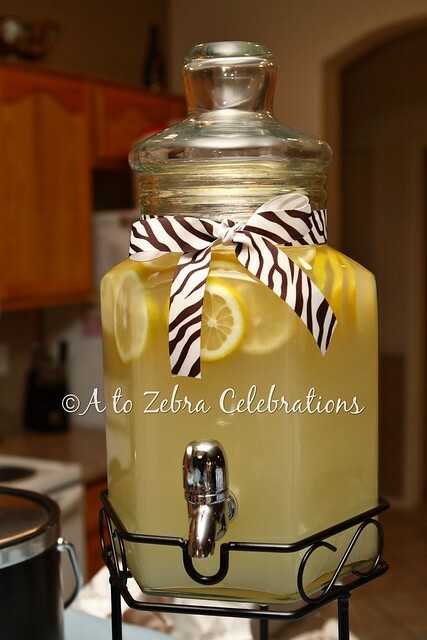 A “thank you for coming to my shower. Luke” sticker on the lid. And here’s my gorgeous friend, Julie. Doesn’t she look beautiful pregnant? Photography by Liz BiesemeyerThank you to all of my friends and Julie’s family who helped me with this beautiful shower. I could have never done it on my own. 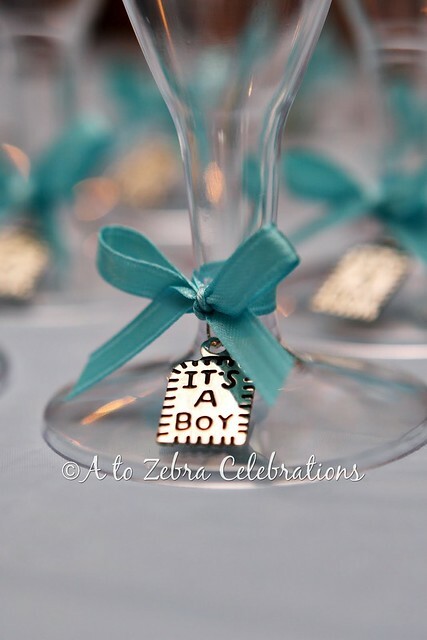 Hi, I love the flutes and it’s a boy charms tied on them with the blue ribbons. Where did you get those items at? 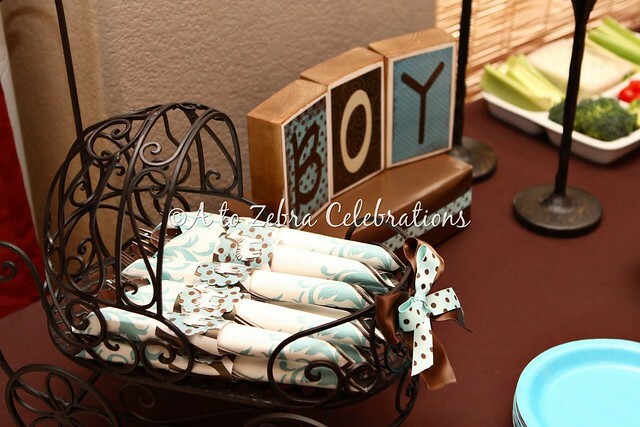 I’m throwing a boy shower for my sister at the end of May. I purchased the baby carriage at the store, not online. However, it was a very random find…I've never seen another one since then. Sorry girls. Do you still think they might have the baby carriage at Hobby Lobby? I couldn't find it either. 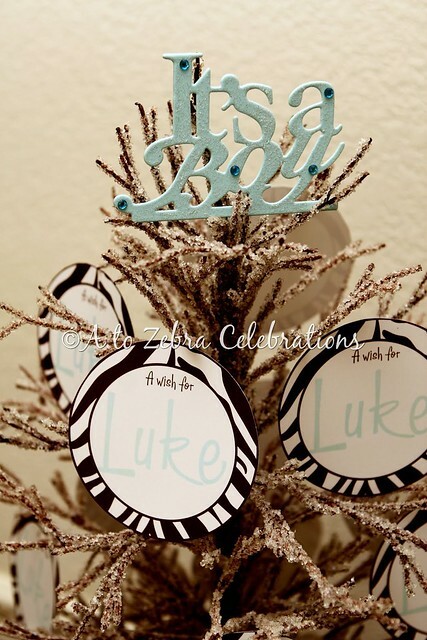 I can't find that baby carriage at Hobby Lobby. Did you order it online? 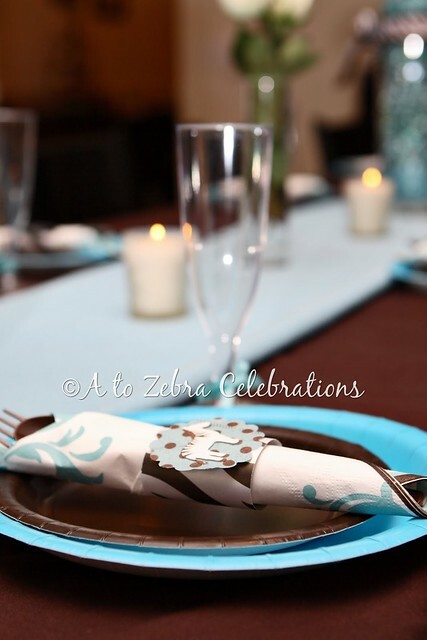 i am so inlove with this setup.. i wanna copy it!!! 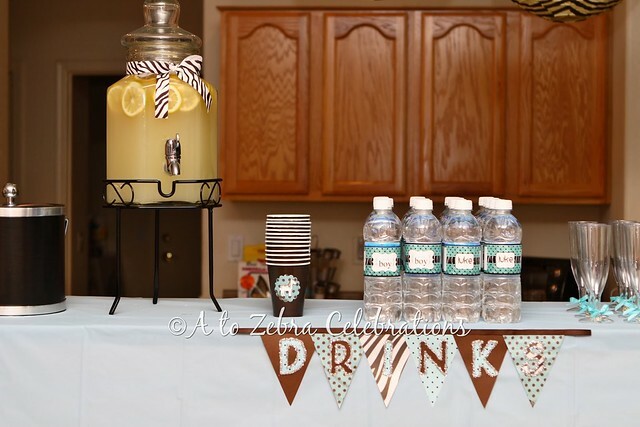 Such a cute party!! The oreo truffles sound delish! You did a fabulous job! Everything is adorable! 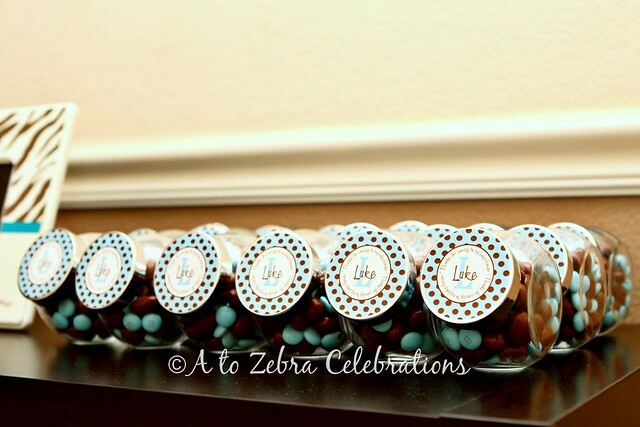 I love the colors and I especially love the party favors and labels! 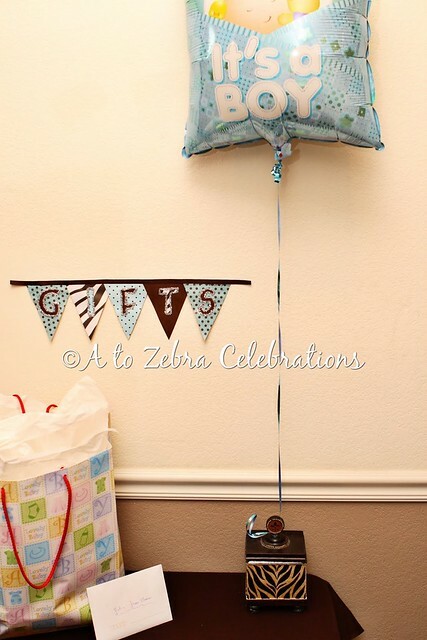 great job on putting together a beautiful shower. I love that shade of blue. 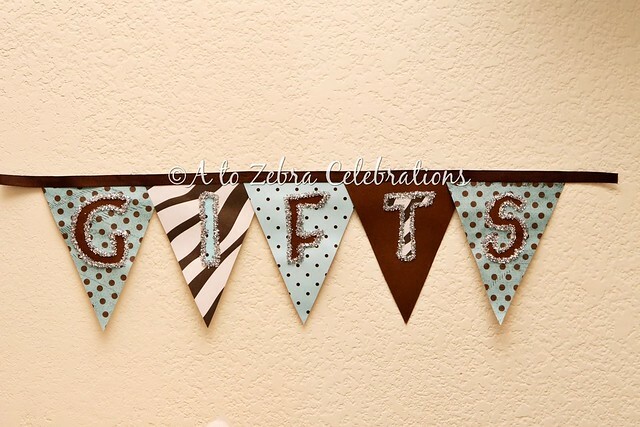 I just had a friend use that color on the walls of her nursery! Everything looks amazing!!! Very nicely done! Absolutely stunning! 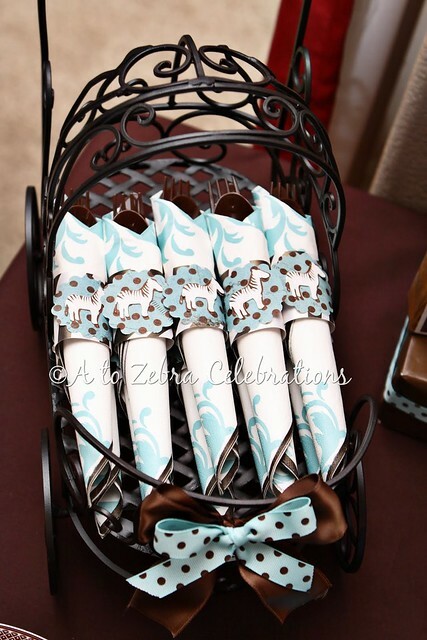 Everything looks to sophisticated, yet fun! I love all the pictures. They turned out so wonderful.